Crack crime thriller also known as "the one that ends at Boulder Dam." 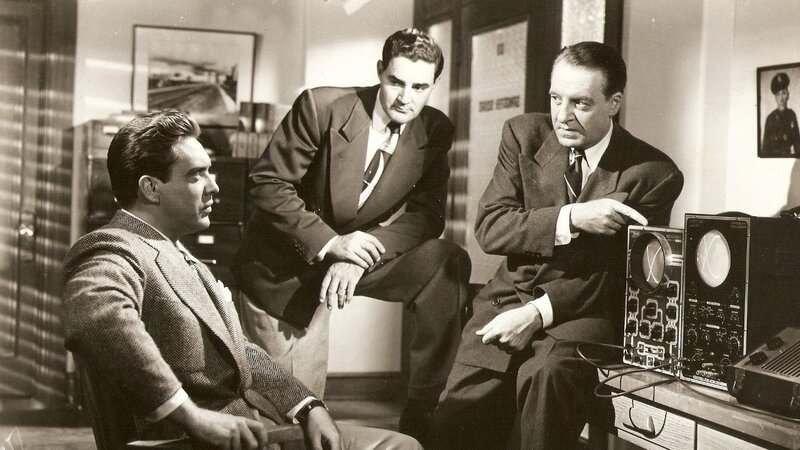 Edmond O'Brien is back rigging radios as in White Heat, only this time on a wrong side of law, him up-and-coming from phone company drone to wire service king. Docu-drama aspect teaches us that wire operators, despite servicing bookies, functioned quite within the law, thus nationwide business in support of crime. As one became more sophisticated, the others' talon sank deeper. 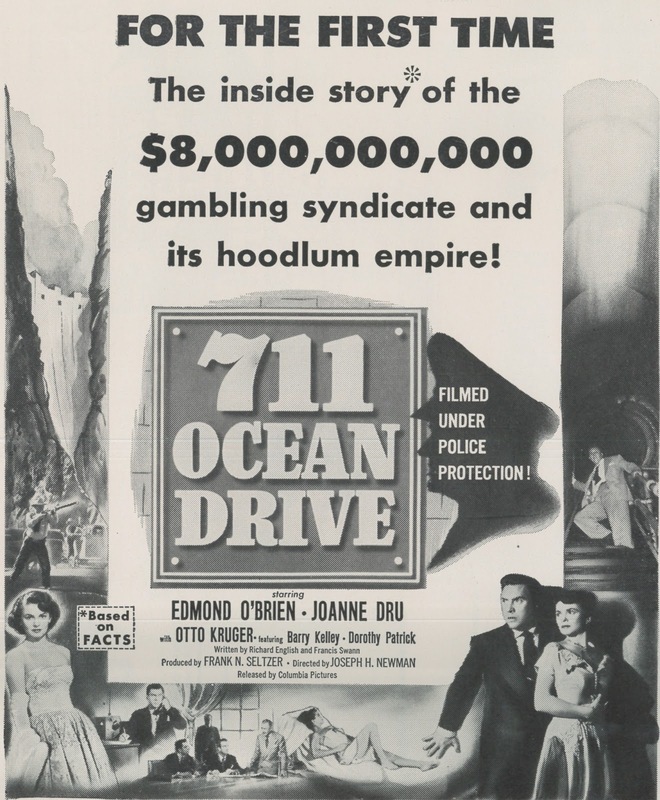 Alarmers like 711 Ocean Drive woke us up to billion+ accumulation of two-dollar bets. You wouldn't call them noir, but there was prolific cycle of such as 711 Ocean Drive against backdrop of Kefauver Senate investigation into widespread vice. Message was simple and direct: Lay down that horse bet and you feed a snake that will strangle us all. A first half of 50's hammered the point with scare pics spun off headlines, free publicity for each courtesy TV broadcast of gov't hearings. 711 Ocean Drive shows how a regular and reasonably bright guy can be sucked into crime. Edmund O'Brien is good with electronics, that a pathway to success or corruption so far as movies think. He'll become almost Karloffian in high-tech service to mad science that is modern bookmaking, ill-got gain pouring forth from devices Eddie builds. The "organization," under calm leadership of Otto Kruger, eventually muscles in. Here is presumed depiction of then-octopus that was the Mafia, but Kruger and first-lieutenant Don Porter are white bread in the extreme, dog heavies in their employ more like ones you'd see in a western. 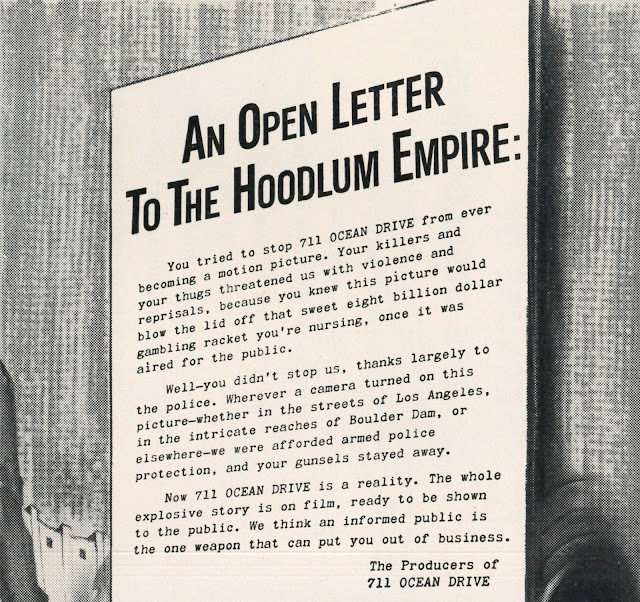 Still, there is at least surface authenticity to 711 Ocean Drive, a cop's narration throughout explaining tricks of horse-parlor trade. Pace doesn't flag, and there's a sock finish at cooperating Boulder Dam, pursuit through its bowels sort of America's answer to Euro sewer chase that climaxed a same year's The Third Man. Indie producer Frank Seltzer had made 711 Ocean Drive late in 1949 with bankroll assist of Edwin Silverman, head man of the Essaness theatre circuit based in Chicago (the two had earlier teamed on three pics for Fox release). They shopped 711 to Columbia and latter would embark on heavy-exploited summer 1950 release. 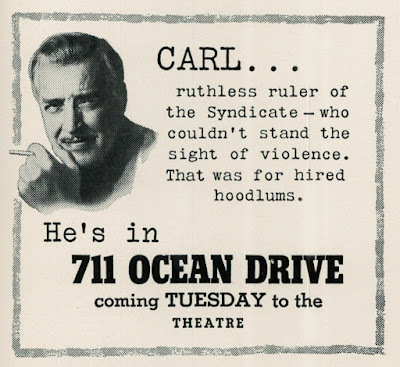 Columbia, like other majors, dealt outside product where profit seemed likely, 711 Ocean Drive their second such buy that year (first being Douglas Fairbanks Jr.-produced State Secret, out of England). Columbia had decided to go whole hog on fresh selling tool that was TV saturation, 711 Ocean Drive their test case. Seven L.A. station execs had proposed the link, their idea to demonstrate value of tube ads. 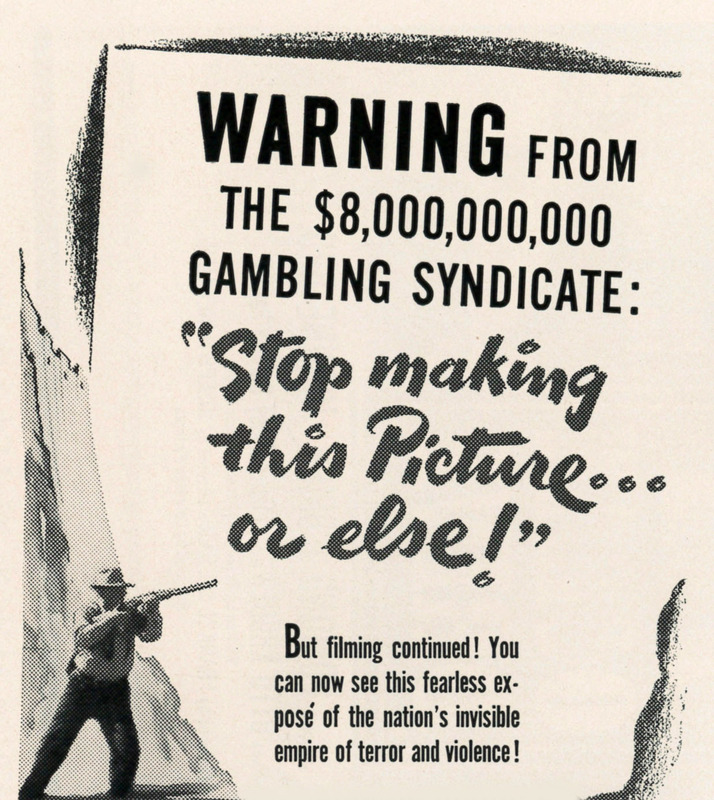 A first six months of 1950 had proven that TV backing could boost a film's draw, latter part of July targeted for the blitz. Two weeks advance of opening was figured a start point for TV ads, Variety estimating that Columbia would spend "between $15,000 and $20,000 for the push" (fifteen broadcast trailers were eventually made). Bugaboo was who should stand for costs, the studio or exhibitors, an argument to heat distrib-theatre relations for years to come. Politics and publicity shared a bed as 711 Ocean Drive neared release, Senator Alexander Wiley (R-Wisc.) fulminating before a special committee that "rat criminals" had tried to stop Seltzer from making his exposé (Wiley ID'ed by Variety as "a long-time friend and frequent champion of the film industry"). All this, plus other official statements, made for good (that is, free) ink on 711's behalf. There were attempts at interference with cast-crew, up to/including physical threats, result the "armed protection of U.S. Forest Rangers" as 711 Ocean Drive went about location business at Boulder Dam. Bigger payoff still was nine Congressmen/Senators who volunteered to go on-camera for a special trailer, their appearance gratis, after a 711 screening arranged by Seltzer. 400 lawmakers were on hand for that, filmed reactions sent out quick by Columbia in "nationwide video blanket of the country." Seltzer followed up with a four-city Eastern junket to tell press and vid outlets of confront with "muscle mobs" that tried to silence him. TV ballyhoo was ramped for July 19 L.A. opening at twelve sites. Columbia and the broadcasters did a first by excerpting an entire sequence (three and a half minute) from 711 Ocean Drive to juice interest. Most helpful was a clip ending with a cliffhanger. 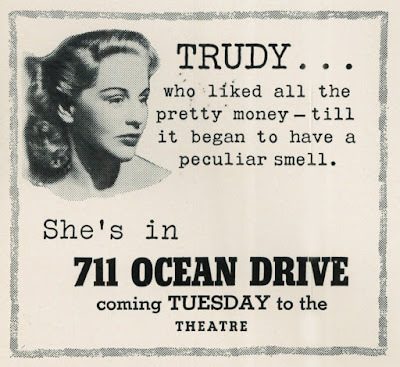 To test effectiveness, the distributor would put spotters in theatre lobbies to ask attendance what had attracted them to 711 Ocean Drive (70% replied that TV was indeed the lure). Radio outlets in New York were meanwhile miffed when Columbia skipped them altogether for promotion, sales putting all of chips on TV and use of the excerpts plus testimonials. Gotham's Paramount Theatre did lusty business, with Louis Jordon in boogie-woogie support, plus Bobby Van, the Fontane Sisters, juggling ... a whole vaude banquet. 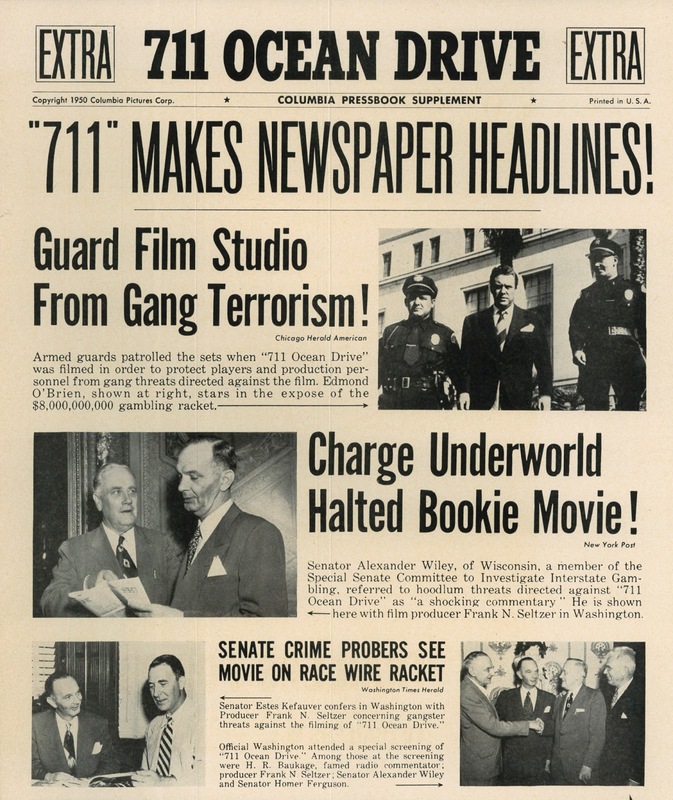 Seltzer pulled further coup by getting ads in local Racing Forms, provided they say nothing "derogatory" about the betting angle, thus removal of crime and police protection copy. 711 Ocean Drive showed what gold could be struck from independent filmmaking. Negative cost to Seltzer and partnering Silverman had been $486,000. They sold the film to Columbia "outright," said Variety, for $800,000, plus "a small percentage for the producers." Seltzer later announced that 711 Ocean Drive had, within twelve weeks after release, "paid off all expenses with a gross of $867,000." Seltzer was pleased enough with Edmond O'Brien's performance and bally assist (the star did multiple P.A. 's) to extend 2% interest in 711 Ocean Drive as reward ("it wasn't in (the) original deal which called for straight stipend," said trades). 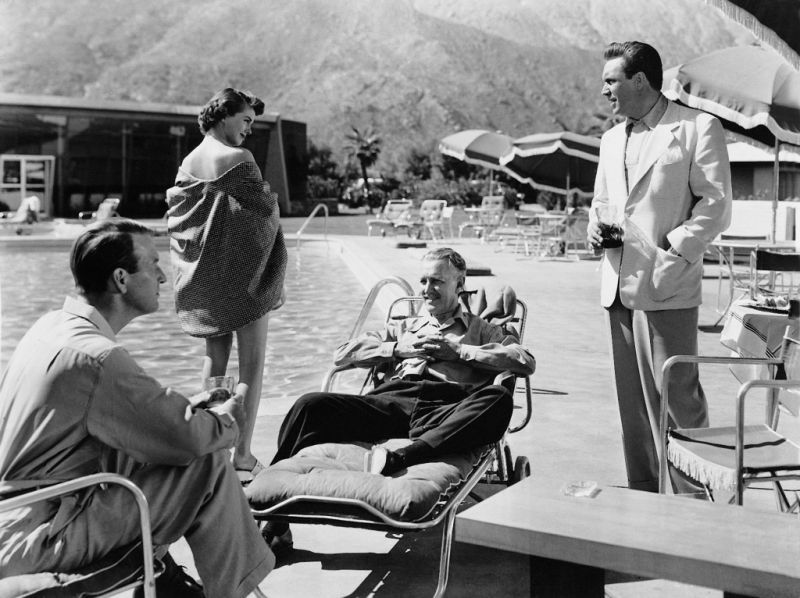 Columbia's Harry Cohn saw value in TV promotion as result of $1.6 million in domestic rentals ultimately taken by the film, and announced to Variety that "Columbia Pictures will utilize television as a selling agent for all of its motion pictures in the future." The "wedding" of pics and TV, he said, was "inevitable." Immediate follow-up for tube spotting would be Born Yesterday. 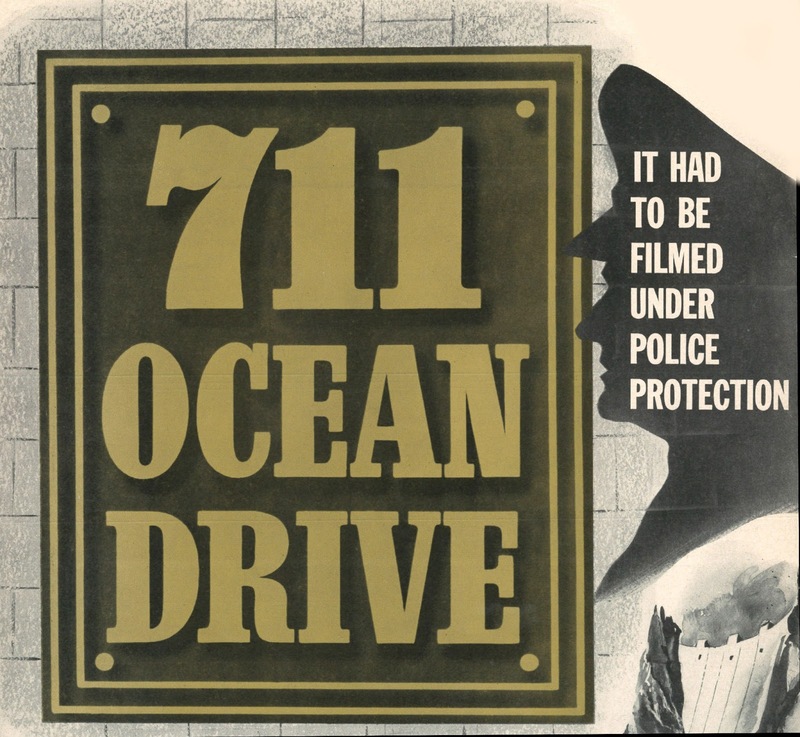 711 Ocean Drive is available on DVD, streams at Amazon and I-Tunes in HD, and has shown up on the Sony Channel in High-Def. Really wanted to like 711 enough I could say it was "great." But "good" is as high I could go. 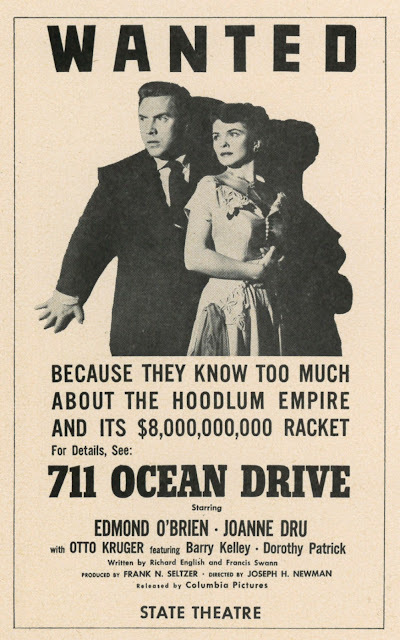 Shouldn't have watched it right behind KANSAS CITY CONFIDENTIAL, which is "great."